You are currently browsing the tag archive for the ‘motherhood’ tag. Have you ever been given the option of opting out of Mother’s Day? A couple of weeks ago I received an email from Scilly Flowers www.scillyflowers.co.uk saying: We’ll soon be sending emails about flowers for Mother’s Day. Understandably some people find this a difficult time of year. If you would prefer not to receive these emails please just opt out by clicking here. Don’t worry, you won’t miss out on any other news or offers we just won’t contact you about Mother’s Day. I applaud this company’s considerate and sensitive gesture towards anyone who finds Mothering Sunday a difficult day for whatever reason – bereavement, adoption, stillbirth, dementia and yes of course, for mothers who live apart from their children. Given the chance to opt out of Mother’s Day has got me thinking about how mothers apart might choose to opt out or opt in to a range options. It’s rare for businesses hoping to profit on mother’s day to give us this choice, but this need not stop us from thinking about how we might do this ourselves by setting boundaries and managing the day on our own terms. Whatever you choose to opt out of or into, I wish you peace of mind this Sunday. As the school holiday period approaches, I invite you to spring clean your self care strategy. Whether or not you have contact with your children, making a conscious decision to take good care of yourself could, together with some sunny weather (fingers crossed! ), relax and restore you over the summer months. What do you gain by not looking after yourself? You might instantly say, “Nothing!” but I urge you to look a little deeper. Do you believe that keeping super busy or more often than not putting other people first, the ‘nice’ thing that ‘good’ mothers do? Do you ignore your needs because you feel you are not worthy of extending tender loving care to yourself? Perhaps you feel guilty about pleasing yourself. Maybe you think you don’t deserve to be happy living apart from your child. Or perhaps you have gone so short of anyone ever showing you sufficient love and attention that you just don’t know how to give this to yourself. To be aware of how you sabotage your attempts at good self care will give you the choice to treat yourself with the respect you deserve, instead of ending up feeling exhausted, over responsible and resentful. Paying attention to all aspects of ourselves will give us an overview of what we need. Exercise and good nourishment is essential to our wellbeing but are you balking at speaking to your doctor or alternative medicine practitioner about any physical symptoms you might have? Do you need to adjust any medication, or have a medical test? Are you menopausal? Menopause usually happens between the ages of 45 and 55 but can occur during your 30s and 40s, up to ten years before menstruation ceases. Physical symptoms can be far more than hot flushes and include headaches, back and joint pain and urinary problems. Memory problems, insomnia, lack of libido, irritability, panic responses and low mood including loss of purpose are common. Menopause is a profound transition, even the marrow in our bones changes. Are peri-menopausal symptoms compounding how you feel as a mother apart? Don’t suffer in silence, have a test and get the help you need. Taking care of our emotional health allows us to take responsibility for our decisions – it keeps us safe and helps us to achieve our goals. Know that you are worthy of wants, needs and desires. Setting and maintaining boundaries prevents us from being blown by every wind. Avoid emotional vampires – kick any inappropriate hangers on off the teat! If you don’t have contact with your child and you have done all you can to remedy this, it’s time to take off the hair shirt and live your life, one day at a time. Understanding and accepting that we cannot change anyone else – neither their behaviour or feelings towards us – helps us move from frustration and rejection to release and peace of mind as we focus on living our own lives. Being mindful of our mental health gives us the capacity to handle the ups and downs of life more resourcefully. It allows us to maintain relationships and communicate clearly. Our thoughts help us reality check our feelings as well as contain our actions and behaviour – vital for good self care. Have an honest look at any bad habits, compulsive behaviour and addictions. Find the support you need, you are more than worthy of this. Keep your mind active. Learn something new and interesting this summer. Development and discovery keeps us vital, young at heart and is an antidote to repetitive negative thinking. What is your word or phrase for your safe place? Choose something that has meaning for you, and say it whenever you need help in coming home to yourself. Whatever your spiritual beliefs, you can take comfort from knowing you are never alone. For some of us this is about being connected to a power greater than ourselves. For others, just knowing that without our will, the breath breathes itself, offering the ease and safety we need. Whether you belong to a spiritual or religious group, a 12 step group, meditate, practice yoga or watch nature unfold with your full attention, gain perspective – take care of your spiritual self. Honestly….how well am I taking care of myself? Consider your physical, emotional, mental and spiritual health. What choices, decisions, changes need to be made? How might I sabotage the changes I need to make? For example, believing that you aren’t worth it, that you don’t have the time, the money etc. Who can I ask to help me find solutions or a workable alternative? Who can I ask to encourage me to make these changes and hold fast to them? It might be considered the season to be jolly, but it is jolly hard being jovial when your Christmas is marred by difficult, little or no time with your children. In the run up to the holiday break it’s not easy to avoid the mass merriment of Christmas songs and cards, turkeys and tinsel to remind us how things ‘ought’ to be. The busiest shopping day of the year (Cyber Monday) has already been and gone, but how can we hold fast through the commercial pressure and festivities when life is not the way we want it? Trying to ignore the fact that the big day will soon be upon us can be just as energy sapping as striving to make sure it’s a happy one. Instead, why not aim for a ‘good enough’ Christmas and end to the year? Maybe if we pace ourselves, lower our expectations over the next few weeks, we can find some peace of mind. Here are my suggestions for a conscious, ‘good enough’ Christmas time. Who, what or where is your guiding star? Who gives you sustenance, what has meaning for you and how can you draw on this over the holiday period? Whether your guiding star is your religious or spiritual belief, time to meditate, a world famous icon, a true friend or family member, or a book or poem that reaches your heart – keep them or it within your sights. Give yourself permission and space to reflect, read, talk and connect as one year ends and another begins. Everyone has a place, everybody has value and you are no exception. If you are feeling redundant or lonely, let the season of goodwill begin with you. Have compassion for yourself – you are worthy of this. Compassion for ourselves allows us to feel compassion for others. Despite any injustice against towards you, aim for kindness and goodwill. Even just a smile, a hello and thank you to a stranger can bring you the warmth and nourishment to be gained from a small act of human decency. It might be the time for wise men but you can trust you inner wise woman. After estrangement or a hostile divorce, some of us have trouble believing that we can make good, healthy decisions. You don’t need to be perfect nor do you need to provide a perfect Christmas for your children. Be your lovely self – that way your inner wise woman will be at hand. If you make mistakes, take responsibility for them. That’s part of what we do as human beings. That’s how we learn, develop and become wiser still. Putting a brave face on things can cause us to lose touch with what we need and lead us to eat or drink too much. This is especially true at a time when so much is on offer – whether this be the office drinks party or the half price tin on chocolates. Taking care of ourselves means that we consider our actions. If we are feeling blue, would it help to limit quantities or time at events? Poor nutrition and too much alcohol will affect our mood. A lack of sleep or exercise will impact on our physical wellbeing. I like to use the twelve step fellowship acronym HALT to check in with myself. Am I Hungry, Angry, Lonely or Tired? If I am, I need to remedy it. Make this very moment count then move on to the next. Don’t spoil today by ruminating or projecting yourself into another time or place. Be mindful of the phone, email, photographs or music taking you away from being with yourself and others in the present. If the present is painful, remind yourself that this too shall pass. Be in the here and now and nurture yourself in healthy ways. I wish you ease and comfort this Christmas. A peaceful 2014 to you. 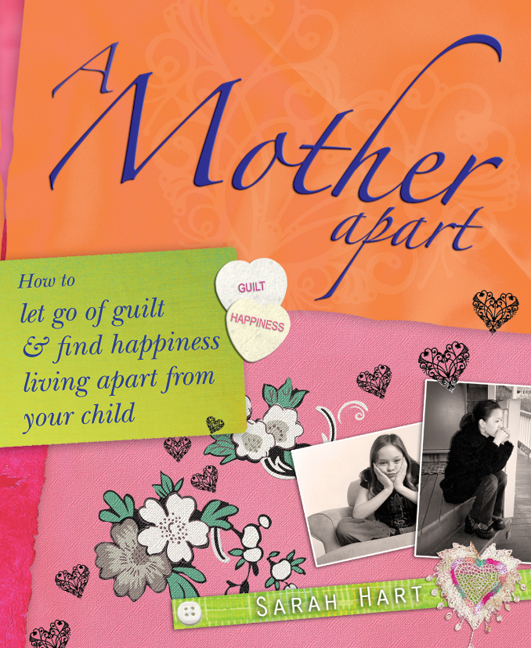 Mothers living apart from their children know a lot about heartache. To a greater or lesser degree depending on our circumstances, we know how it feels to be grieving or regretting, or angry, guilty, lonely, broken and tired to the bone of painful, repetitive thoughts. For sure, many of us have a lot to heartbroken about. But it’s helpful to remember that life can be heartbreaking for everyone. We can find balance and take inspiration from others who haven’t, as far as we know, experienced how it feels to live apart from a child. Sitting in the morning sunshine with a cup of coffee, I was expecting to pick up a few gardening tips from Alys Fowler as I read her weekly column in The Guardian Weekend. Titled,‘Heart and soil’, 29 June 2013, I was drawn into a very personal and poignant description of Alys’s own heartache and most hearteningly, her method for living with it. Sharing that her husband has cystic fibrosis, a long-term illness for which he is frequently in hospital, she described how time in her garden restores something in her. Alys says, “If you are feeling blue, have hit a wall you’re unable to climb, or it all just feels unfair, can I suggest you go pull some weeds?” She points out that there is evidence that a bacteria in the soil called Mycobacterium vaccae boosts the immune system and our serotonin levels. “Gardening is about the now, but is also a statement about the future. The best of gardening is never instant; it comes in the form of a packet of seed and has jeopardy, hazard and heartbreak built in, but wonderful rewards, too”, says Alys. I think Alys’s description of gardening is an inspiring metaphor for our lives. Life isn’t instant, it’s an ever changing process. Like a packet of seeds, there is risk, danger and heartbreak. And yes, there are wonderful rewards too. Despite rejection, misunderstandings, alienation and antagonism, if we look for it and allow ourselves, we will also experience joy, serendipity, pleasure and contentment. How can we as mothers apart from our children receive lightness of heart? Accept that life is a mixture of up and down. Can we hold an intention of turning towards all of our experiences with compassion, without forcing anything, especially when we are hurting or feel ugly about things or other people. We can lighten our load and our hearts by treating ourselves with kindness and non judgement. Not as something to strive for or achieve but as something to offer ourselves, to allow the possibility of that being there in the mix, even when we are broken hearted. Cherish yourself. If you’ve been giving yourself a hard time lately, stop. There is no need. If we’ve done things we would rather not have, that’s alright, we were doing the best we could at the time. There is nothing fundamentally wrong with us. We are ok. It’s wonderful to be who we are. Our feelings are appropriate. We are right where we’re supposed to be. Set down the burden. Sometimes for the sake of your wellbeing and that of others, it is best to let go. Maybe just for a while to regain your strength, sometimes as time passes you might come to know it will be for a longer while, maybe even forever. When it comes to family relationships there are no guarantees, no ‘this is how things should be’. There are only people, sometimes cruel or misguided and often just doing all they know how to do right now. If holding on is causing you pain, give yourself a break. You don’t have to suffer for love. If you have a heavy heart, why don’t you try a little gardening therapy? You don’t need a garden, even getting your hands into the soil as you sew a pot for your windowsill will do. I’ll let Alys guide us – she says, “When you’ve got enough soil on your skin to lift your heart a little, sow some seeds. If you are feeling truly broken, sow something for around the corner: a late sowing of basil, dill or nasturtium to eat in a month or two; flat leaved parsley to take you into autumn; honesty, foxgloves, viper’s bugloss and stocks so that wonderful crescendo happens again next year”. I’m off to get some soil under my fingernails.